While relaxing beachside can be great, my family prefers to stay busy on vacation — even when in Florida. We were thrilled to satisfy our sense of adventure with a Marco Island WaveRunner Tour. When my son was 8, he was obsessed with sharks, whales, dolphins — pretty much any sizeable sea creature you can imagine. Unlike most kids his age, he’d pour over nonfiction selections from the library and collect long lists of facts about marine life. Wondering how many teeth a shark has over its lifetime? He was your man! So when we picked the Paradise Coast of Florida for our family spring break vacation, I knew if we could put him in front of a dolphin or two, he’d be in heaven. 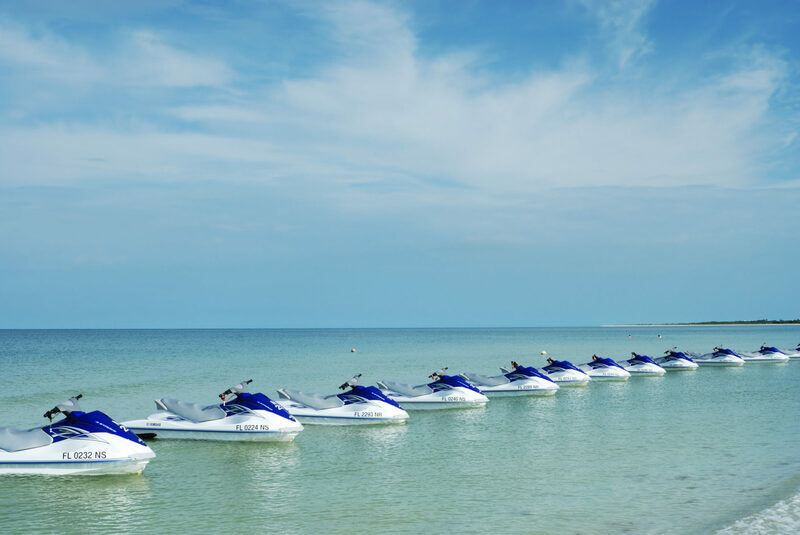 Just our luck, our hotel, the JW Marriott® Marco Island Beach Resort —just a few minutes from Marriott’s Crystal Shores — offered a 90-minute WaveRunner tour of the surrounding area. They promised us the chance to spot dolphins, eagles and maybe even a manatee. Perfect! Having never been on a jet ski or WaveRunner, I was unsure about taking the driver’s seat, especially out on the open ocean! What if I flipped? To my relief, our incredibly friendly and enthusiastic tour guide gave us a thorough introduction. He taught us how to operate the WaveRunner, showed us a short video and assured us that no one had ever flipped one under his watch, and I was not likely to be the first! Kids can’t operate their own WaveRunners, but they can ride with parents, so my dolphin-loving son hopped on with me, while my 12-year-old joined my husband. When the ocean is calm, the WaveRunners leave right from the JW Marriott beach. I hesitantly took off on my WaveRunner, gaining confidence as we went along, although my husband laughed since I was always the last one in the group to arrive at our stops. Guided WaveRunner tours run twice a day at 10 a.m. and 12:30 p.m. from the Marco Island JW Marriott. Book your tour in advance during busy seasons like spring break and summer, as the tours fill up quickly. 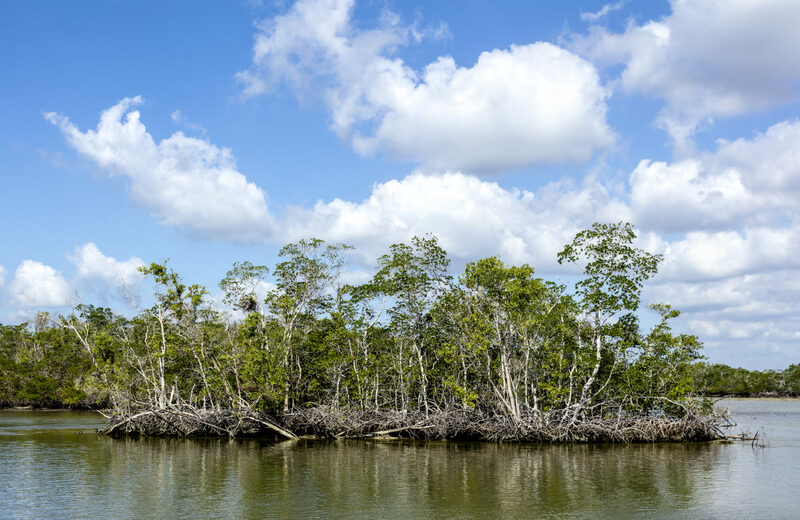 Situated just north of the Everglades, Marco Island is the last town on Florida’s Gulf Coast before you hit unspoiled natural beauty. 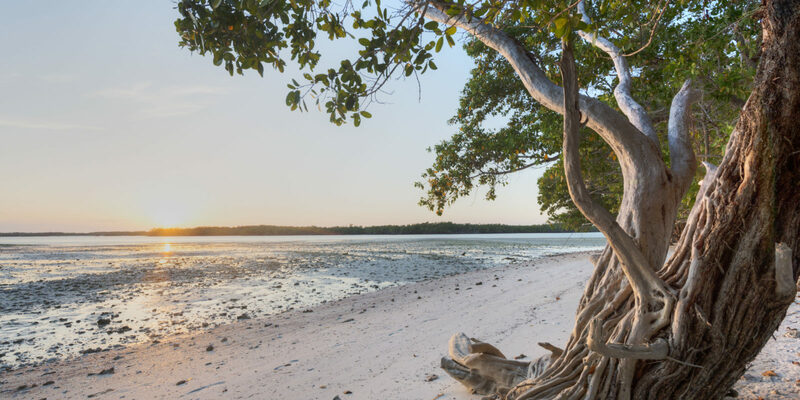 Just off the island’s coast sit the Ten Thousand Islands, a National Wildlife Refuge that includes more than 200 miles of mangrove forest. This area also features outstanding shelling. Exploring the mangroves on a WaveRunner was surprisingly fun! The trees, which sit directly in the water with their roots exposed, line the waterways, making seemingly endless canals that we could weave around as we followed our guide, who knew all the best places to see. It was a bit like navigating a race course, hitting a max speed of around 30 miles per hour with spray hitting our faces and our eyes on the lookout for wildlife. For those interested in birding, we saw an abundance of the more than 200 species that visit the islands. 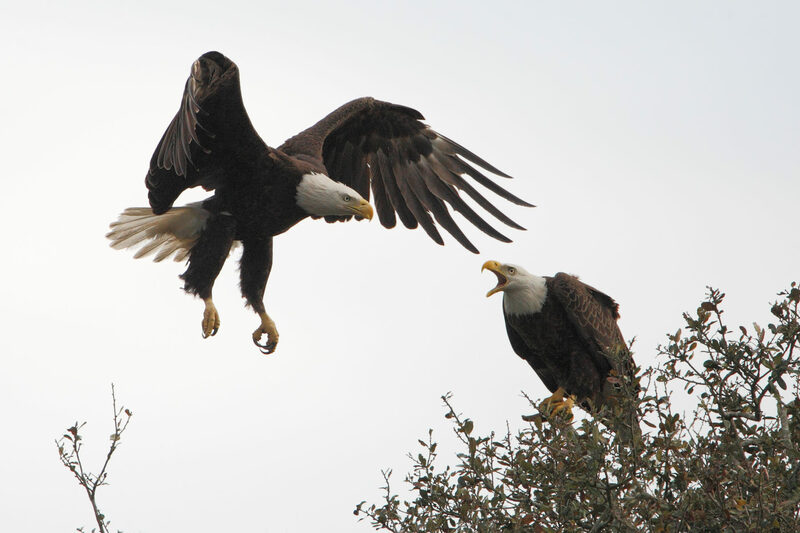 We were especially lucky to spot multiple eagles, which our guide pointed out along the way. Don’t forget your sunscreen. The Florida sun reflects off the water, and you can burn even when wearing a hat. Our guide explained that every WaveRunner tour is unique. Each day, he would take guests to the spots where he’d seen wildlife that day or where they tended to congregate. Once we were back in the open ocean, he waved to our group to slow down, huddle up and turn off the motors on our WaveRunners. Why? 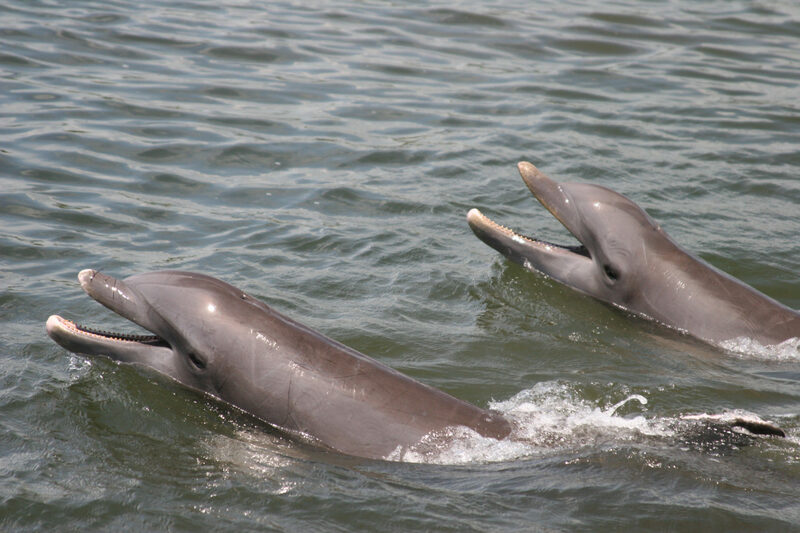 We were suddenly in the midst of a pod of bottlenose dolphins! The motors and noise startle them, so he encouraged us to quickly and safely turn them off and remain still. Close enough to touch, an abundance of fins rose in and out of the water around us. My son was delighted! Better yet, our guide took us to another spot just a short distance away, and there we witnessed a dolphin on the hunt for food. My son loved learning from our informative guide, who explained how the dolphins work together to trap the fish, and then we watched it play out live right before our eyes. There’s no better classroom than that! As we continued on our journey, my son counted every fin he saw, so he could share the total number with his teacher and class back home — by the end of the tour, the count was in the hundreds! As a final surprise, after seemingly traversing miles in the open ocean on our WaveRunners, we found ourselves sitting in front of a scene right out of a science fiction movie. Jutting from the water, as though from another planet, were several uninhabited domed structures. These domes make up the Cape Romano Dome House, which was built on land but, due to storms and erosion, has since been retaken by the sea. These other-worldly structures are a definite must-see when boating or jet skiing off Marco Island or Naples, and many visitors have left their calling cards written in graffiti on the domes. The ruins also serve as a reef, attracting diverse marine life and making it a prime snorkeling locale.